Crystal Blue believes strongly in providing customer service that goes above and beyond. Therefore, we offer 24/7 emergency plumbing repairs. Any time of the day or night, and day of the week, any week of the year: when you call on us, we’ll come running to help. In Sacramento, CA and surrounding areas, Crystal Blue provides fast emergency plumbing service, with a live operator to assist you through your plumbing emergencies. A minor clog or a dripping faucet is one thing. A clogged sewer line, a toilet that’s overflowing or a massive pipe leak spilling out water is another. These are plumbing repairs that need to be done as soon as possible. After all, plumbing problems rarely pick a time when it’s convenient for you to have them repaired! With over forty years assisting home & business owners with their plumbing needs, Crystal Blue makes sure its fixed fast and right the first time. What Counts as a Plumbing “Emergency”? We sometimes hear this question from our customers, along with the similar question, “When do I know I have a plumbing emergency on my hands?” The simple answer is, “A plumbing emergency is whatever you think is a plumbing emergency.” You can’t be wrong about your worries, even if the problem turns out to be a minor one. When your peace of mind is in jeopardy because of plumbing issue, we want to be there to reassure you and have the repairs done. Clogged sewer line: There is nothing worse than having your whole house backing up and no drain is working. Making your plumbing drain system inoperable. Remember adding water like running faucets, showers, flushing toilets will only make this worse. Limit your usage until one of our Emergency Plumbers can get to you. Overflowing toilet: This is plumbing problem that triggers an immediate panic reaction. However, stay calm and turn off the feed valve to the toilet to stop water flow (or open up the tank and rig up the chain to do the same thing). Then call our plumbers to see what needs to be repaired so you can use the toilet again without worry of water damage. Massive pipe leaks: Burst pipes are a more frequent problem in colder climates. But pipe corrosion can also cause sudden leaks that are noticeable as water stains along your walls or ceiling. These need to be repaired fast because of the damage that can be done. Loss of water to the house: If you notice no water coming from any faucet or other fixture in the house, the first thing to check is if it’s a municipal issue. (Ask your neighbors if they’re having similar problems.) If it isn’t, you’ll want professional plumbers to find out the source and fix it—you can’t go for long without running water! Sump Pump Alarms: Its never fun when your sump pump alarm is going off and even worse when it happens in the middle of the night or on a weekend. Getting a qualified plumbing professional who is knowledgeable with sump pumps will save you headaches and money. No Hot Water: Having hot water is a luxury we expect. When our water heaters fail, we need these fixed faster then later. Fixing pilot lights, leaking or broken water heaters is our specialty. You should always have licensed and insured plumbers take care of any plumbing service, no matter what it is. But it’s especially crucial to have professionals when it comes to a household plumbing emergency. You don’t want to risk making the problem worse with a DIY attempt, and waiting to have an amateur fix it can end up being even an even bigger problem. Call the pros! Crystal Blue Plumbing, Heating & Air is here 24 hours a day to provide the right plumbing repairs, done fast. 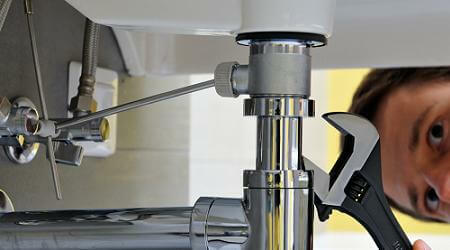 We offer excellent plumbing service to Sacramento, CA and the surrounding areas.